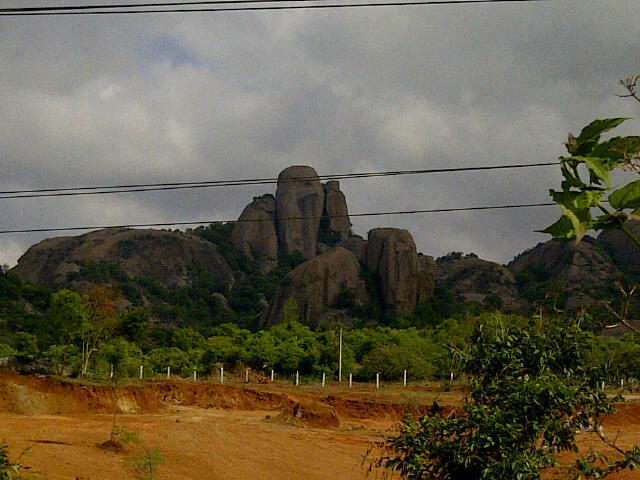 kadsur: Zen on Mysore road...!!!! I stay in Girinagar to reach RR nagar arch it takes less than 5 kms. Early morning at 4.30 am i can say i have almost reached the exit of the city. That makes it the single most reason for me to hit this road. Probably you can argue how does it matter anyways early morning any road will be traffic free. Correct it doesn't matter what matters is what you do when you returning, it can be afternoon or evening, probably you are tired you want to reach home or you don't want your average to drop very badly. 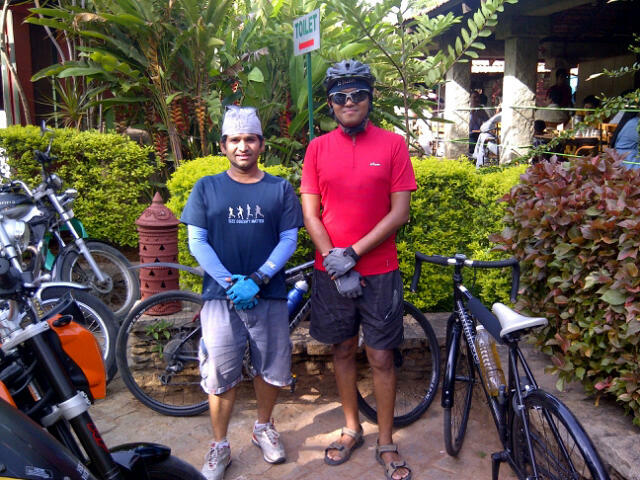 28092011 me, Sanjay - man who gave a new dimension to my biking and Anoop- quite friendly guy, they were doing their first ride to Mysore. As i keep riding especially on the return ride, SH 17 is all the more attractive, not simply because i love to eat but because i can digest anything and everything, it is because am hungry. Since morning i must have been eating everything, now i have reached a level am bit choosey and i got to have a choice (Mac Donald, Kamat, Thatte Idli, Maddur tiffanis, Corner house, CCD, Adigas and the list goes endless......) and this stretch addresses that. 10032012 me, Kishan- who rode to Mysore, Pradeep, Ram prashanth, Aravinda bhatt-whom i met on Mysore road and got introduced to group ride, Uday. All this started with an idea, some day i should be back to lunch at house after completing my ride to Mysore and back. That is like i should able to do the ride in sub 10 hrs including breaks. Around January of 2011 i started preparing for it. 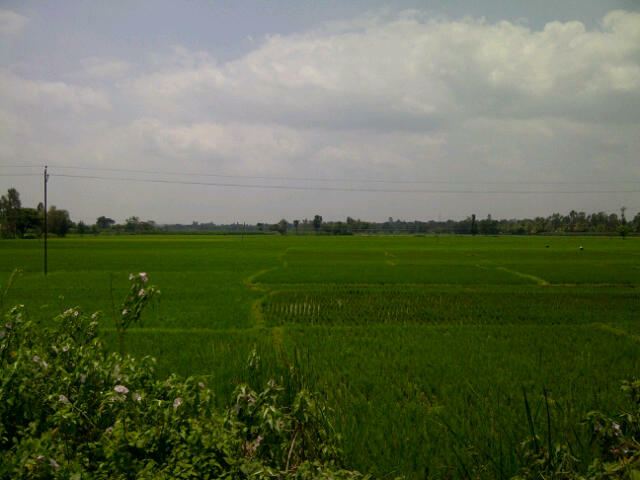 Mid March i attempted my first round trip to Mysore (it was on my Firefox road runner a Hybrid...). Never focused on timing all i wanted to do was to complete the ride successfully. Just wanted to know how it feels and to understand what it takes to build it to my goal. 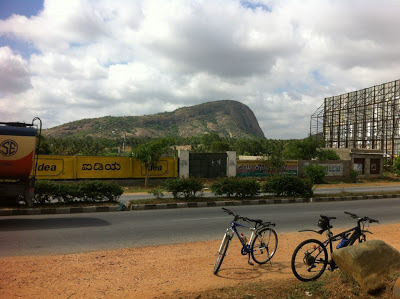 This ride was in the month of March return ride was hell due to heat. I was not tired due to lack of fitness i was exhausted due to heat. It also happens to be my longest ride then. With a bit of struggle in the end, and dropping in the pace i completed my first ride in 17 hrs. It was a successful one without any incidence. I was quite familiar with the stretch as a practice ride i have done century rides on this stretch. 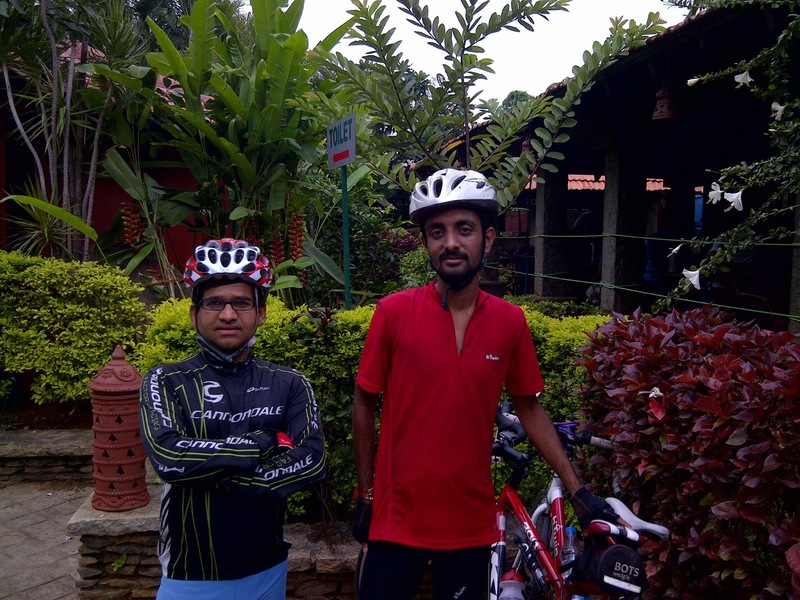 16062012 with Kishan - admire his mulit-focused lifestyle(he is a, cyclist, runner, motor biker, trekking and i don't know what more in store in the years to come....) on a century ride (me on single speed bike). 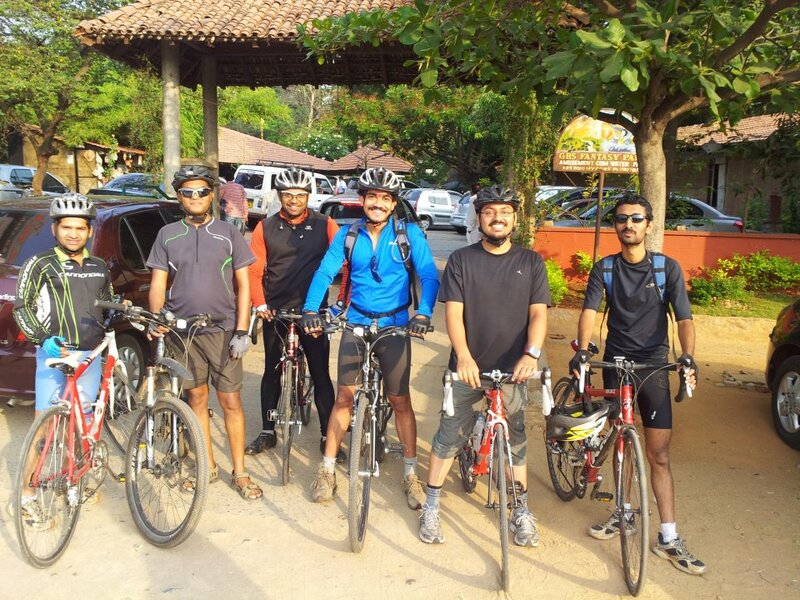 I understood couple of things from this ride, March may not be the month try, because heat will unnecessarily take away the energy. This is not the bike that will help me to achieve my goal, i need to have a better bike. I also need to work on reducing my weight, i need to lose at least 5 to 6 kgs. Then attempt it again that will tell me what is the gap. I was in no hurry and was clear what is needed for, 'Endurance is not enthusiasm, it is patience'. Entire 2011 i didn't attempt Mysore again. I started working on the area what makes me a strong rider and build pace. 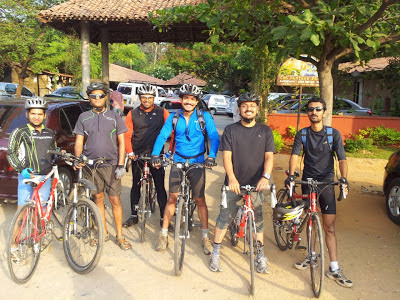 During the month of May i switched over to commuting by bike, not only to office and to every where (that is story itself will keep it for an another post). In October i bought a road bike (Merida Race 880) that added some advantage. Building more base miles, i started seeing difference in my kmph. 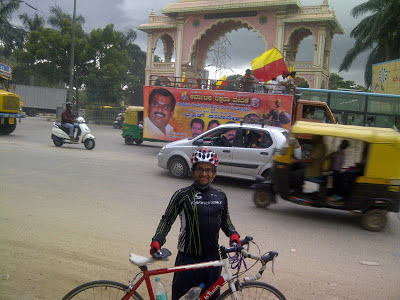 After buying a road bike i was very tempted to attempt Mysore again before the end of the year. I said nothing doing went on working on myself. 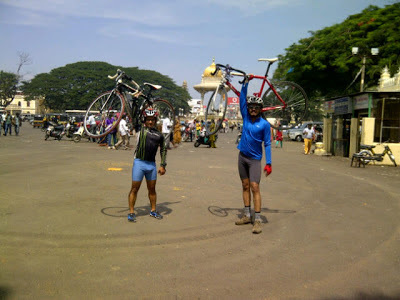 I set fitness goal for the year 2012 and Ride to Mysore and back got a place in that, Goal was to do it in Sub 13 hrs, a good 4 hrs off from previous attempt. Same time i bought another road bike (bTwin sport1)idea was to use the road bike for commuting. I didn't want to use my hybrid for commuting because in need to accommodate time for running and got to have some energy left for doing cross fit activities. One of the goal for the year was also doing 10,000 kms as i missed it previous year by 400 kms. 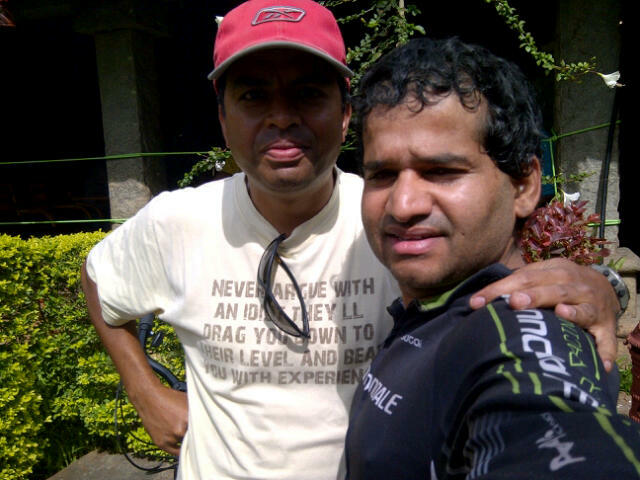 22072012 with Babu shekar, at janapadaloka it was his week in to cycling and he was on 130 kms ride, to channapatna and back. 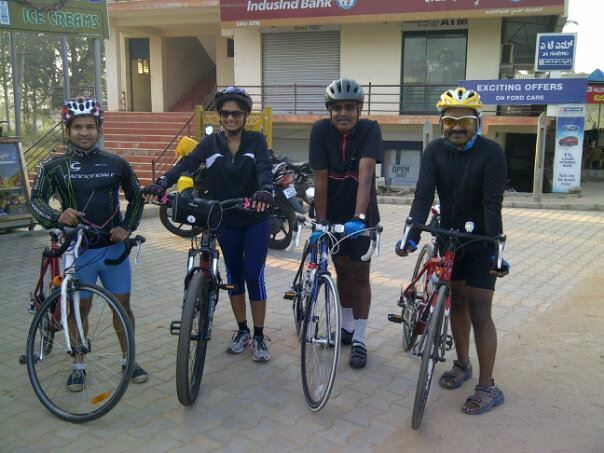 Compared to 2011 i started doing more 100+ kms rides, many 150 kms and 200 kms rides were done. 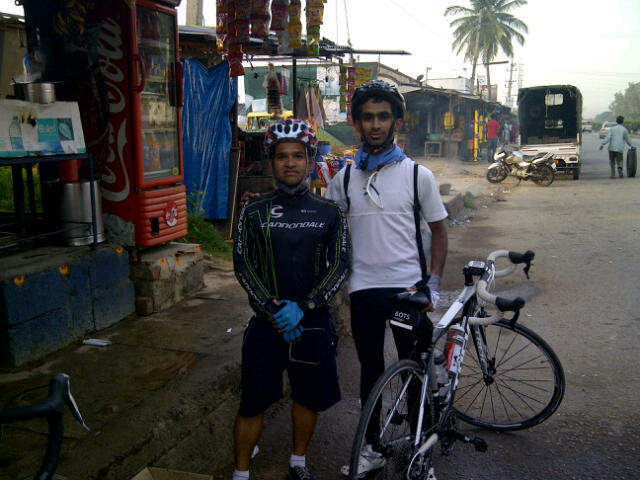 Some where in June i did PB for 200 kms ride ie in sub 8 hrs including break. During this time i was quite clear Sub 13 hrs is a done deal. 18th August 2012 i decided to attempt it. Previous night when i went to sleep my gut feeling was tomorrow is the day and i can even shoot for better timing and also mentally mapped what points, what time i will reach and where i will stop for breakfast and lunch . Took my bTwin road bike and started off, this was different from my earlier rides. I was more looking into my watch than the road. Weather was very pleasant it was helping me compared to my March ride previous year. 29072012 Kanva reservoir just before reaching channapatana on the way to Mysore need to take right turn, it is 8 kms from the turn continuous 1 to 2% gradient. On the way back between Ramnagar to Bidadi it rained, it was little more than drizzle, i was quite happy with it, because i considered it as a sign of heavenly blessing. From Kengeri i sprinting to make it to Sub 12 hrs and finally i did it. There are couple of things i have improved and did differently compared to my previous attempt. 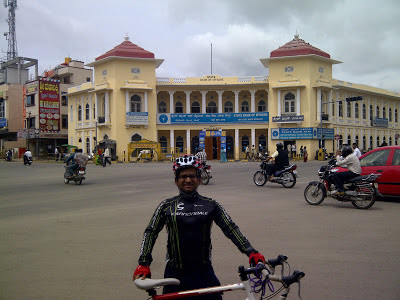 When i attempted my first ride to Mysore i did few century rides in that stretch. What i changed before attempting my 2nd ride was, i did lot of double century rides in this stretch. That made a difference to my timing. Heat was less another reason for improvement. No doubt road bike contributed that goes without saying. 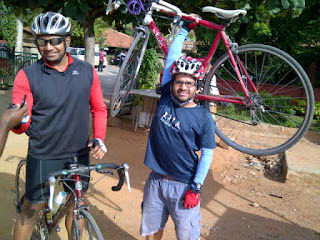 Current body weight 57 kgs (before the ride.....hehehehe). Now as Sub 12 hrs is achieved, the next goal is a real tough one to crack. It needs a different level of strategy. 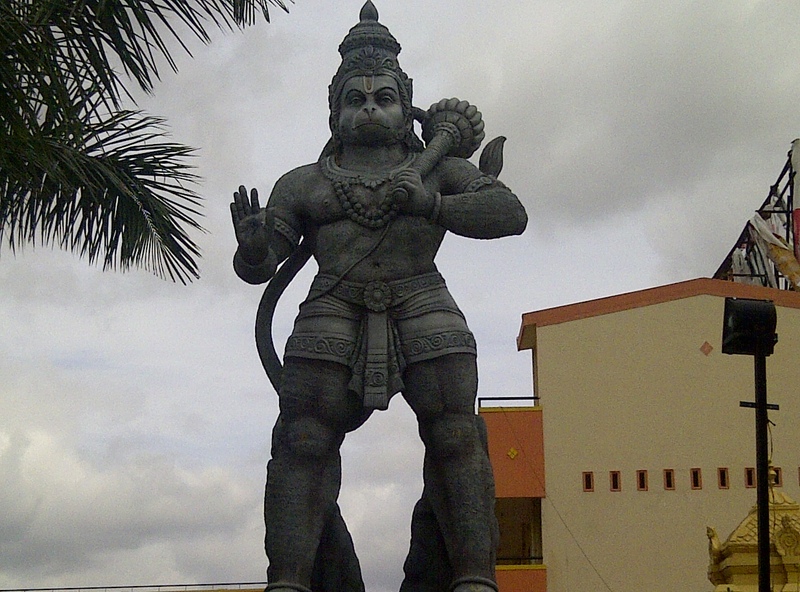 The one more thing what i am already started doing is doing more of round trip to Mysore, post this ride on August, i did twice again to Mysore. 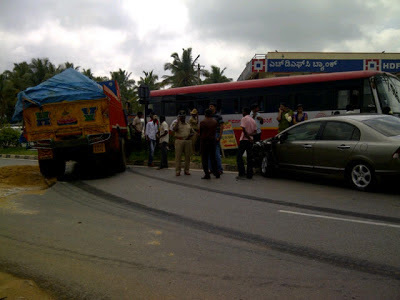 15082012 at bidadi sand truck and honda civic collide this was just few seconds before we enter this place, me and Harishankar were doing this stretch. First one is with Amith Biligere, he and me started from their respective houses and reached Merida Junction 4.55 am. It was his idea why not we do Mysore on this route (decided on Monday night 10pm...), as I have not done Mysore this way immediately said yes as yesterday was holiday. Quickly reached very close to Harohalli and stopped for a photo and then took off. After the stop at kanakapura for breakfast (I won't be boring folks here writing where all we ate, what we ate, everyone knows one can't do this distance without eating....lol) we reached Malavalli. After Malavalli, heat, lack of sleep, climbs started sapping the energy (9.50 am...) some where very close to Bannur decided to take rest. 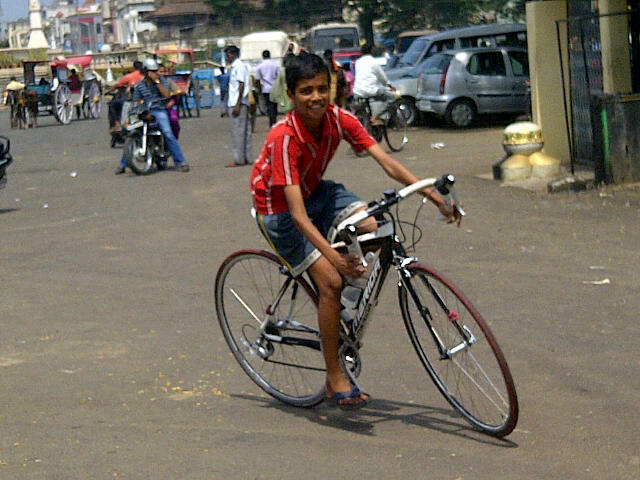 Slept, I was concerned about the bike Amith is cool fell off to sleep not worried about the bike at all. I didn't want to run back bangalore. 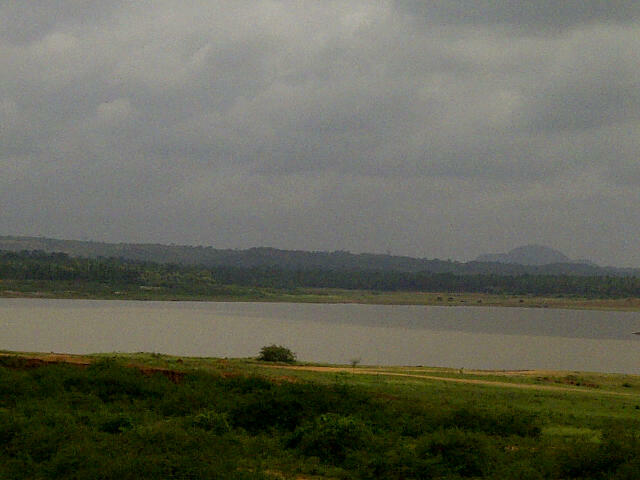 After 45 mnts rest here started again, distance was not going as we did in the first 100 kms. Reached exit of Mysore Colambia Asia Hospital at 2.30pm. Took a photo and started off again. 18082012 met Ram and Jnana shekar (not in the pic) they were driving to Madikeri and i was attempting sub 12 hrs, pic in Mandya. Now it was a different story, the first stop was at Mandya. A good few minutes break when about to start, I saw Amith's saddle bag and asked him, are you carrying puncture kit in it (this question after completing close to 200 kms....lol). To my shock he says NO, feel like shooting him then and their itself, neither I was carrying gun nor puncture kit....hehehe. Next biggest surprise was, what is in it, he said, "T-shirt" man I was in COMA almost. 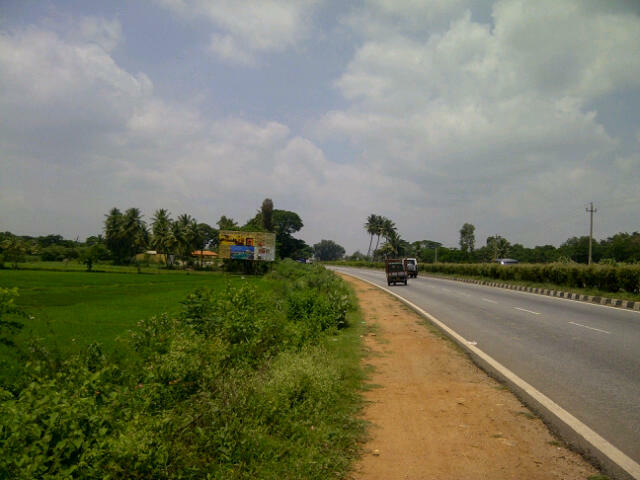 We took off, after the exit of Mandya it was Cauvery issue going on and the roads were closed. Very long traffic jam/stopped, more than enough place to ride the bike. I reached the front, just got down from the bike, saw the mob. 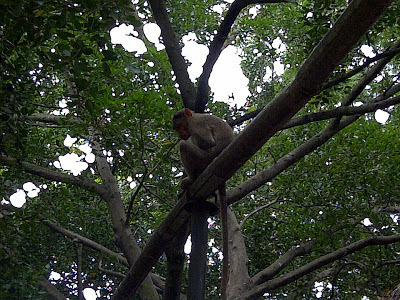 Just stood there for few seconds, spoke to them, they offered me to sit with them, sat and they gave a TEA. It was so tasty felt super satisfied with it. Then left. Same was the case blockage of traffic in next 3 places. 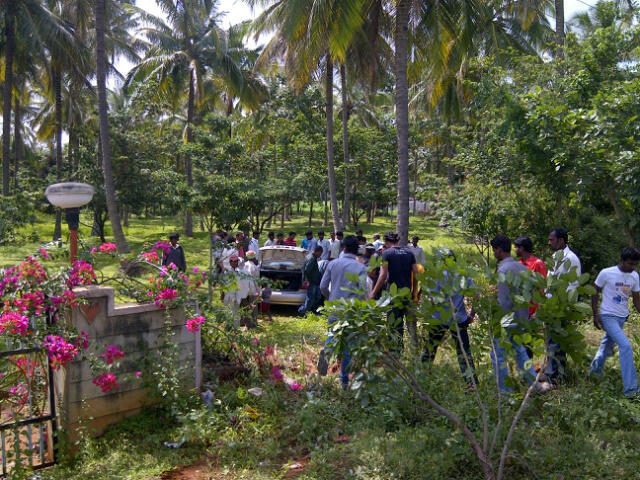 Didn't waste much time, reached Janapadaloka, within minutes Amith also reached. At 7pm we were leaving that place, few localities were having coffee looked at us, (it is complete DARK....)and asked where are you going, said Bangalore, should see the expressions on their face....wish my phone was not dried, would have clicked the photo to demonstrate it. Then we realized, we don't have, BLINKERS, REFLECTOR JACKETS, HEAD LIGHTS (both of us....lol....morning 90 mnts and evening 2.30 hrs rode in complete darkness....). Didn't justify anything, smiled and took off. 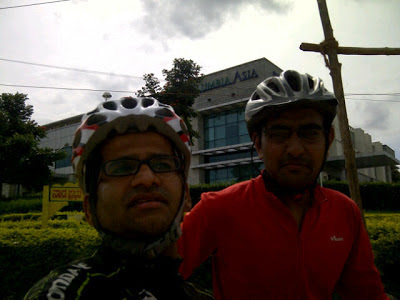 01092012 me and Pradeep - very committed to cycling and turning into a fitness freak. Now it was clear, both will be riding as close as possible in a single line. He in the front me back and extreme side of the road. 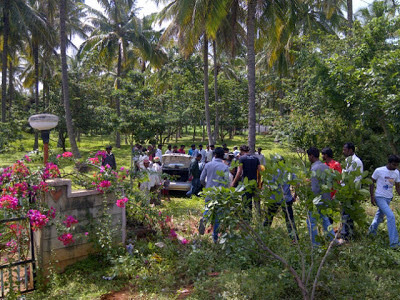 Very close to Bidadi, all this while Amith was riding at a steady pace suddenly accelerated, little bit of gap created. I saw Amith stopped, looking for his Mobile and other stuff it has fallen, he ended up going over the pot hole (that is the only one in this stretch....). His t-shirt, keys, mobiles all over the place. After few minutes we traced it. At bidadi I was riding behind him, they way he was riding I felt he is practicing, "cadence drill" I took the lead and directed after wards. Took off again and reached house at 9.35 pm. 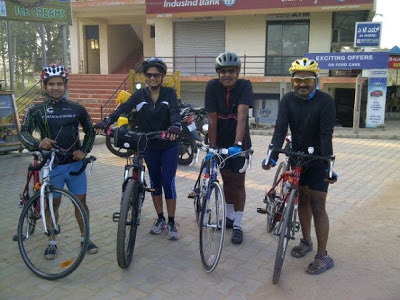 16092012 met my non-cycling best friends Naveen, vijay, ashok, pradeep and avinash after Ramnagar and i was doing my 200kms ride, Mandya and back. With so many rides there are only 2 instances of an accident i could see (just after it had happened), i thank God for that. It is also an indication of how safe this stretch is. For the thousands of kms what i did only once a private bus guy pushed me out of the road, otherwise i never went off the road by force only by choice. I have cycled at 4 am and at 11.30 pm also. I consider Truck fellows are the best, countless instances they don't even honk worst is private buses even though except for that one instance. 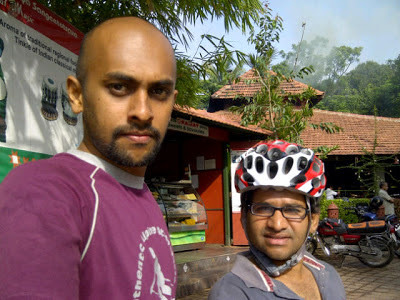 22092012 with Shreyas - surprising to see his energy level (he worked night shift and doing this ride without sleep), they did Mysore and bk. i completed 10,000 kms for the year this day. The last ride to Mysore and back was with Ram, who was riding road bike for the first time and i took my Merida for the first time too for the round trip. 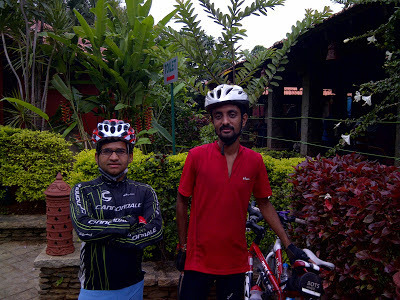 We did pretty good on the way back met Opendro and Ganapathy and rode with them for the rest of the ride. 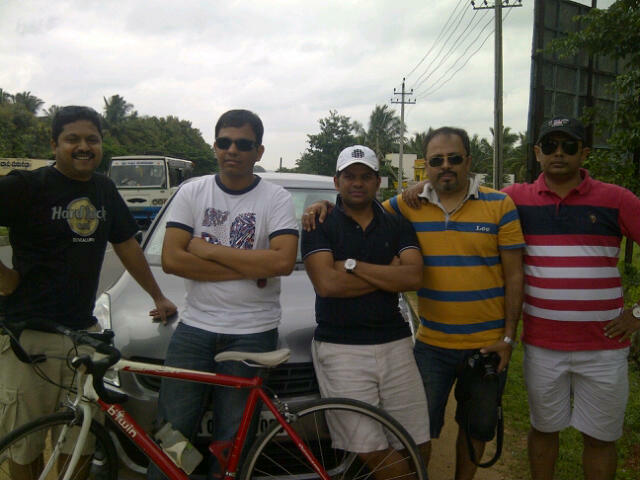 It was superb fun riding with them and trying to match the pace set by them. 02102012 with Amit Biligere a good rider, we did Blr-Kanakapura-Mysore-Mandya and back to blr and it was his first round trip on the same day. At Channapatna when we stopped at MCD for a food break, Opendro had his first flat and me also. This was my first flat on Mysore road for all the centuries, double centuries and close to triple centuries what i did on this road. 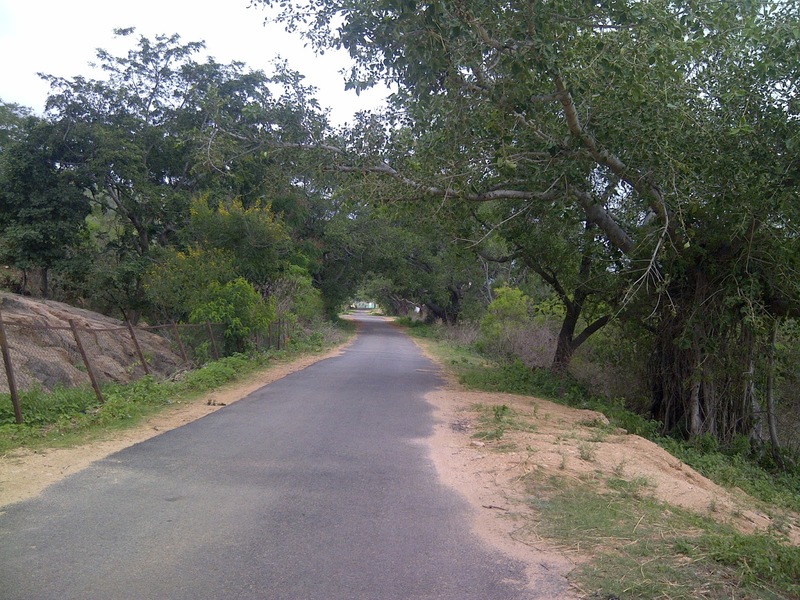 Few thousands of kms what did on this road till date. With the help of Opendro and Gana we completed it super fast and started the ride again. 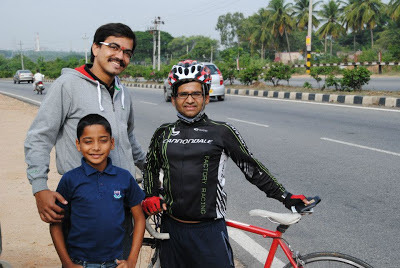 27102012 me and Ram prashanth- superb rider, surprised to see the way he rides considering he was on road bike for the first time and first time round trip to Mysore in a day. By this time it was dark Gana had a good head light he was riding last and rest of us were ahead of him taking the help of his head light. When we are almost exiting Ramnagar i again had another flat, we fixed it in less than 10 minutes (thanks to Opendro and Gana for their skill in fixing it fast...i may not able to do this fast, need to work on it). 27102012 boy who clicked the above photo got round of my bike as an appreciation for his help. Just before Bidadi we stopped again for food and some awesome sharing of their Brevet experiences, it was such a learning for me the time spent there having food. Then we took off and reached house by around 10 pm. 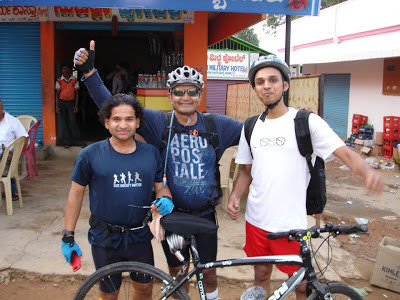 03122012 ride to Bidadi and back with Dr. Ramesh - a humble and down to earth, Diwakar- very enthusiastic guy, Gnani- fitness freak, a runner and cycled first time, strong rider. That completes my year 2012 as i have broken my hand right now, the first two months of the year 2013 will not able to ride, got to see how do i progress on a journey called Mysore and back in sub 10 hours!!!! ZEN-This actually derived from a Sanskrit word that means meditation.That emphasizes enlightenment for the student by the most direct possible means. Also means to put your mind to something - contemplate. Some say it means "mind" even though it really implies what you do with what we call the "mind". Thank you dude, yah it is long way to go. Thank you Hari....it is little more than 2 years...sure will try that also. Thank you Prakash.....for me it is still a journey and long way to go, true lot more to explore. As ever, you are a very good writer. Inspiring and crisp yet brings back fond memories riding with you on Mysore Road. I have to Admit if not for your guidance I would have given up Bi-cycling completely !!! Thank you once Again for everything. May God Give you health and wisdom to inspire more like me to reduce the carbon footprint. Thank you Sanjay. Oh not sure i can digest all those kind and appreciating words. I acknowledge. Thank you Prashant sir,i admire you a lot, wish i will be do crack sub 10 hrs some day. As i will be losing 2 months this year no clue on how i will be fairing in 2013. Thank you Sohan. Sure, am starting on minus in 2013, got to see how it unfolds. Thank you Dhaval, nice to know you took out time to read. Thank you Jaya Lakshmi. Appreciate you took the time to read. Thank you Mukunth. 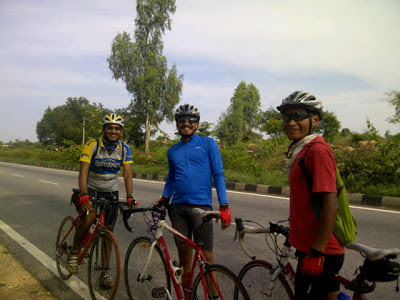 That is good, if you thinking of doing your first 200 kms, worth i took the time to write. Thank you krishna....For the encouraging words, sure love to ride with you. Wonderful Anil. Wish you many more rides and friends. We are sure you will break the 10 hour limit this year. Best wishes always! Thank you Kannan. Thank you for your wishes, wish i crack sub 10 hrs. Great post Anil! I was fascinated reading it all! I hope you do the Sub 10 hrs this year! Thank you Teyamayi, good you liked it. Thank you Ram. Oh yah, you are an awesome rider, i enjoyed riding with you too. For me too it was down at end of the year. wish you ride with you again. Thank you Pradeep, appreciate the time you took to read. Thank you Srinivasa, good you liked it. Thank you Gnani. Happy you took the time to read. Great going Anil. It was long but engaging and very inspiring. I have no doubt in my mind that you will complete your journey within 10 hrs. Whoa! Just read 'About Me' before clicking Publish. Bare foot runner, donated blood 50 times??? You must be a superman! Thank you Nikhil, appreciate you took the time to read this post. i understand it is long post, it was more of a diary of more than 2 years work. Thank you once again for the kind words. Nice writeup, Anil.. You're the motivation for me to do some long rides, man.. Thank you, acknowledge the kind words, will ride together some time.